^ Quickfacts.census.gov - Ashley County - accessed 2011-12-06. ^ American FactFinder - Hamburg, Arkansas - accessed 2011-12-06. 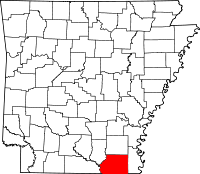 ^ Quickfacts.census.gov - Crossett, Arkansas Archived 2012年9月10日, at the Wayback Machine. - accessed 2011-12-06. ^ http://www.census.gov/geo/www/maps/DC10_GUBlkMap/cousub/dc10blk_st05_cousub.html#A Archived 2012年10月13日, at the Wayback Machine.